In Britain in the mid Seventies, during the height of glam-rock, a very different sound could be heard wafting on the breeze from Canvey Island, Essex – the sound of rhythm and blues band Dr Feelgood. Once London pub-rock circuit favourites, they achieved national status in a relatively short period, picking up widespread critical acclaim and a Number 1 album on the way. In an age of increasing extravagance and sophistication at rock shows, they provided a return to what he music was originally all about – simplicity, spontaneity, rebellion and passion. The Feelgoods were originally based on Canvey Island in the Thames Estuary. There Wilko Johnson (real name John Wilkinson) had established a reputation as a guitarist, perfecting a style inspired by his idol, Mick Green of the Pirates (Green’s riff on the original version of ‘Shakin’ All Over’ has earned a rightful place in rock history). 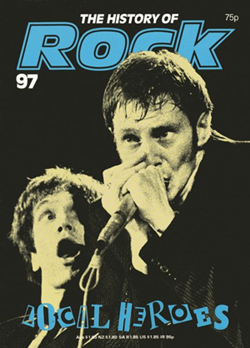 Wilko played in his first group, the Roamers, at 16; he later formed the Heap, playing at local weddings and working men’s clubs for £2 a night. When the band dissolved, he left to study English Literature at Newcastle University, following this with a trek to Nepal on the hippie trail. On returning to Canvey, he was approached by Brilleaux (whose family had moved there from Ealing, London, when he was 13) and John B. Sparks, a pair of schoolmates who shared an interest in American blues and R&B and had played in various local jug bands. Johnson accepted their offer to form a band, and, after an initial line-up that included pianist John Potter and drummer 'Bandsman' Howarth, recruited former Roamer John 'the Big Figure' Martin as permanent drummer. With Johnson the leader, the band adopted the name of Dr Feelgood (the title of an old Pirate B-side, written by US bluesman Willie Perry) and practised in a local church hall, forging their own style from their perspective influences, which ranged from the Pirates, Sonny Boy Williamson and Chuck Berry to Bo Diddley and Elmore James. Their first dates were in 1972 in pubs and rock’n’roll clubs in the Southend area. For a while they were the backing band for faded Sixties pop star Heinz (formerly of the Tornados), all the time priming their own set of material. In early 1974, on the advice of local musician Will Birch (later of the Kursaal Flyers), Dr Feelgood broke into the embryonic London pub circuit. Despite a disastrous first gig at the Nag’s Head, Islington – they were mistakenly booked as an Irish jig band – they gained quick recognition. At this stage of their career, no band better illustrated the pub-rock phenomenon than Dr Feelgood, clearly in their element in a sweaty, crowded bar. Their attacking form of R&B was coupled with a magnetic air of menace and delinquency. The obvious focal point was guitarist Wilko Johnson. Dressed all in black, with pudding-basin hairstyle and manic stare, he darted about the stage with jerky, puppet-lie movement, wielding his telecaster like a machine gun. In the summer if 1974 the Feelgoods got the support slot on a national tour by Dave Edmonds and Brinsley Schwarz. They received rapturous receptions and much critical acclaim, and as a result were signed to the United Artists label. Later in the year their long-awaited debut album, Down By The Jetty, was released to mixed reviews; many observers felt that it failed to capture the excitement they generated on stage. The 1975 Naughty Rhythms Tour of the UK saw the Feelgoods share the billing with Kokomo and Chilli Willi. They completed the year with their own, head-lining tour and a second album, Malpractice, featuring such abrasive originals as 'I Can Tell' and 'Back In The Night'. Following a debut tour of the US, the band returned home in September 1976 to find public and critical enthusiasm at its height. In October the release of their third album, Stupidity, marked the peak of the Feelgoods’ career. Recorded live in Sheffield and Southend, Stupidity went straight to Number 1 in the UK charts and remained in the Top Fifty for two months. The albums non-stop, fast and frantic R&B was delivered with a rawness that harked back to Sixties. 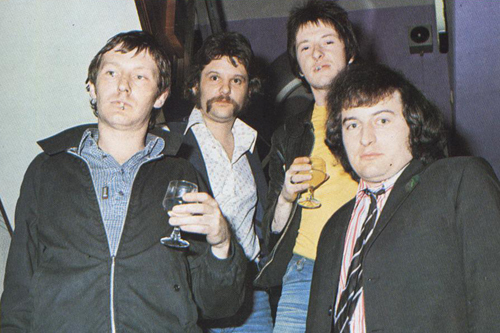 Fin des années 70 : Lee Brilleaux, Sparko, ‘Gypie’ Mayo et the Big Figure. Their success, however could not disguise a growing friction within the group. Johnson walked out after a blazing row over material during the recording of their fourth album in March 1977. The remaining Feelgoods recruited the unknown John 'Gypie' Mayo from Harlow, recommended to them by American boogie-rocker George Hatcher. Hough lacking Wilko’s obvious visual appeal, Mayo was a more broadbased guitarist, allowing the band to side-step from rigid R&B into a more mainstream style. Mayo slotted into he band’s relentless touring schedule with surprising ease, making his recording debut on the Nick Lowe-produced Be Seeing You (1977). Betcween 1977 and 1981, Dr Feelgood produced seven albums of varying quality, though none was without the occasional flash of inspiration. They had their first (and only) UK Top Ten hit single with 'Milk And Alcohol', a track from the otherwise disappointing LP Private Practice (1978), recorded with the much-vaunted producer of Blondie, Richard Gotterhrer. 1979 brought a critically-slated live album, As It Happens, plus an improved studio set, Let It Roll, produced by long-time British blues devotee Mike Vernon. In 1980the band entered the studios with Nick Lowe to cut what many fans regards as their best post-Wilko album, A Case Of The Shakes. By this time, however, the band’s fortunes were on the decline. Their two 1981 albums, he live On The Job and a compilation, Casebook (both on Liberty United), met with disappointing sales, and in the summer Mayo left the group due to the pressures of constant touring. Ex-Count Bishop Johnny Guitar was brought in as his replacement and the touring continued, although a year founder members Sparko and the Big Figure also called it a day. A new album was released after their departure on Chiswick, Fast Women And Slow Horses (1982), but sales were again low.